Lawrence Schrader, M.D., F.A.C.S., founded MidSouth Orthopedic Associates to provide the highest quality orthopedic care to West Tennessee and the Midsouth. MidSouth Orthopedic Associates' is located at 927 Cordova Station Avenue in Cordova, Tennessee. 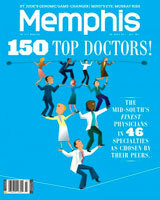 Dr. Schrader performs surgery at Delta Medical Center in Memphis and at St. Francis Bartlett. He is also the Orthopedic Consultant for the Arlington Developmental Center. Our philosophy is to provide the highest quality, state of the art orthopedic care, while maintaining compassion and concern for each patient’s individual needs. This means treating the whole person, not just their injury or illness. Many options usually exist for treating any problem, and these need to be tailored to your individual concerns and circumstances, such as work, school, athletics, or family situation. Dr. Schrader will take the time to evaluate your medical condition with appropriate examination and tests such as x-rays, CT scan, MRI, and Dexascan, if needed. Your diagnosis will be explained thoroughly to you and your questions will be answered. You will be educated as to the treatment alternatives, and provided with a recommended plan. Dr. Schrader will be happy to offer you medical, surgical, and even alternative treatments after these discussions. Dr. Schrader has introduced new technologies to the Midsouth. He was the first surgeon in Tennessee to perform the partial procedure, which he has been doing since 1996. This procedure allows a virtually outpatient partial knee replacement, offering minimal time off work and rapid rehabilitation. This technique can provide many years of pain relief for those with knee arthritis, and can delay, if not entirely eliminate the need for total knee replacement surgery. Of course, if a total joint replacement is needed, Dr. Schrader has extensive training and experience in all forms of joint reconstruction, and was among the first surgeons approved by the F.D.A. to use the mobile-bearing knee implant. 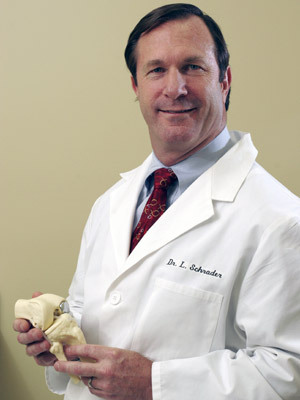 Sports medicine, including counseling as well as the latest arthroscopic surgical techniques, are of interest to Dr. Schrader, owing to his athletic background as an All-American Athlete in college. He recently reentered the athletic arena in 1999, becoming an All-American again in Masters Track and Field, taking a Silver Medal in Hammer Throw at the National Championships in Orlando. In 2000, he again competed in the Nationals and won the Silver Medal in the Hammer Throw. Competing in the SouthEastern Masters Championships he won the Gold Medal for the 35 lb weight throw. In 2001, he won three National titles in the Combined Power Lift, Bench Press, and the Curl. In track, Dr. Schrader won three National Titles in the 35 lb weight Super & Ultraweight throwing competition by throwing weights up to 300 lbs. Many orthopedic conditions are painful, which may be the primary reason for loss of function. This is especially true for arthritis. Many people have significant X-ray findings but minimal or no pain; they need medical care, but not surgery. For most, however, it is the pain that limits their life and causes them to seek care. Once this has failed conservative medical care, then surgery becomes an option. Dr. Schrader believes that the least invasive procedures that accomplish this are the best. This includes rehabilitation and post-operative pain management. Dr. Schrader utilizes a rapid recovery pain management system that actually supplies numbing medicine to the wound, allowing less use of drugs and more rapid rehabilitation. We want you to focus on wellness and recovery, not pain. This system can actually go home with you for outpatient or overnight procedures.